Carabao-based dairy farming has become a viable enterprise in the Philippines. Experts said it is an emerging industry that is seen to have the ability to address food security and offer income-generating opportunities to Filipinos. According to the Philippine Statistics Authority (PSA), in 2013, milk production in the country was 19.5 million liters. This was 5.59 percent higher than last year’s level of 18.5 million liters. Of this total, 33.6% were from carabao’s milk. Despite the potential of this industry, however, local milk production can only contribute 1% of the national dairy requirement. Dairy products are the country’s third largest agricultural import after wheat and soybean meal (Philippines. Dairy and Products Annual. Oct. 2014/AgroChart.com). To meet the demand for this commodity, milk production research and development (R&D) interventions and effective strategies to boost the supply are being continuously introduced. As part of pursuing development goals for the dairy industry through science solutions in the country, the Philippine Council for Agriculture, Aquatic and Natural Resources Research and Development (PCAARRD has bared its Industry Strategic S&T Plan (ISP) for dairy. The Philippine Carabao Center (PCC) is seen as playing a big role in the implementation of the plan. The PCAARRD ISP for dairy is aimed at increasing production to meet local demand and decrease import requirements by 2020. Its strategic R&D focuses on technology transfer through the promotion of genetically improved dairy buffalo, commercialization of food safety compliant milk handling and other processing technologies and, community-based technology promotion and transfer for increased milk production. Through S&T interventions, the PCAARRD provided funding support to seven technology transfer projects across Regions III, IV, VII and VIII through its S&T Community-Based Farm (STBCF) and TechnoMart (TM) modalities. 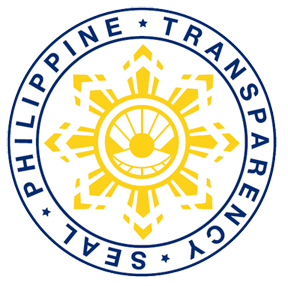 These projects have a combined budget of Php23.9 million, wherein 70% (P16.7M) is from PCAARRD and the rest from PCC and other stakeholders. The STBCF and TM are two important components under the Pinoy S&T Services for Farmers and Entrepreneurs (PSF) Program. These modalities are PCAARRD’s transition platform from technology demonstration to technology commercialization. STBCF promotes wider adoption of S&T interventions to increase productivity and empower farmers in a given community. It aims for sustainable supply of raw materials in support of the TM enterprise. The TM aims to fast-track the movement of S&T products from source to the markets, increase product value, establish and implement business matching, synchronize strategies with other sectors involved and track the road toward the commercialization of the S&T products. Of the seven projects, four are ongoing and will be implemented until 2016. These are 1) “Commercialization of Grass/ Forage Corn Silage for Dairy Buffaloes in Lupao, Nueva Ecija through TechnoMart; 2) Community-Based S&T Project on the Preparation and Utilization of Urea-Treated Rice Straw (UTRS) as Fodder for Dairy Buffaloes; and 3) Enhancing the Carabao-Based Dairy Enterprise in Magdalena, Laguna through TechnoMart 4) Use of Flushing and Supplementation to Enhance the Carabao-Based Farms in Baybay Leyte. The results of the on-going STBCF and TM projects will provide bases for more effective and efficient implementation of the PCAARRD ISP for Dairy. 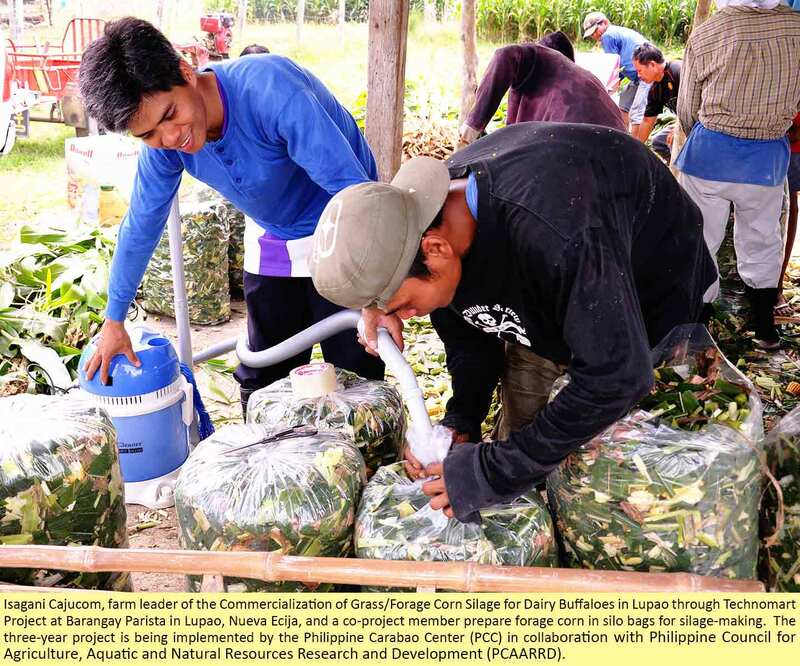 The project aims to: 1) establish private or coop-led commercial producers of silage in Nueva Ecija; and 2) promote community-based commercial silage production as a source of additional income for farmers. Project leader Dr. Eric P. Palacpac, who is PCC’s R&D coordinator, said that corn silage is an enriched forage that can help address problems on nutrition and forage deficiencies during lean months. Silage-making can be easily adopted by farmers for farm use or on a commercial scale because it only requires simple equipment and low input costs, he added. The ongoing three-year project (April 2013-March 2016) is piloted in Lupao, Nueva Ecija. A group of farmer-cooperators, whose members were selected due to their significant production of forage corn and having land availability for corn planting in the targeted area, is involved in the project. As of September 2014, a total of 397,658 kilograms of forage/silage were produced by the selected farmer-cooperators from about 13 hectares of land. The forage/silage was sold to farmers, private farms and PCC-operated dairy farms and generated a net income of Php448,920.55. rainings, field day, study tours and promotional activities were initiated to spur the interest of other farmers to patronize the use of silage in their animal feeding management. Constant project monitoring and conduct of team meetings are regularly conducted to document and analyze the farmer’s feedback and report generation. In response to the need for sustainable production and supply of conserved forages for feeding of dairy buffaloes, the CBSTF intervention through the feeding of urea-treated rice straw (UTRS) was introduced as another dairy technology for community adoption. “Rice straw is forage with poor quality but when treated with the right amount of urea and/or molasses, it will improve its crude protein contents from 4% to 7%,” project leader Dr. Daniel L. Aquino said. “The improvement in the nutritive value will lead to the enhancement of its palatability and digestibility. In effect, this helps increase the feed intake and overall productivity of the buffaloes,” he added. During the first year of its implementation, 38 dairy farmers from the three partner-cooperatives in Llanera and General Natividad towns were trained for UTRS production and feeding. They were able to produce 73 tons of UTRS from the collected 200 tons of rice straws. Ninety-two percent of the rice straws targeted for collection for the 1st production cycle was already attained. Forty-seven percent of these were already produced as UTRS. The UTRS were use as feeding intervention were fed to 12 lactating cows, which were on their third month of feeding intervention. The animals were able to produce 4.7 kilograms of milk per day each compared to the 3.5 kilograms milk produced from the controlled cows in the study. For three months, each cow produced 423 kilograms of milk. This translated to a gross sale of Php17,766.00 at Php42 per liter. An additional Php3,702, or 30.20% increase in income was realized when the cows were fed with UTRS. The actual UTRS demonstration benefited 45 farmers from Nueva Ecija and 73 farmers from Pangasinan. Based on the 2013-2016 plans, the project is aims to encourage 100 dairy farmers to adopt UTRS feeding for their dairy buffaloes and this has shown very encouraging results. The project aims to: 1) increase volume and ensure quality of raw milk collected through the establishment of community cluster milk collection system; 2) comply with food safety and GMP standards; 3) capacitate major stakeholders/partners and team members to manage and sustain a profitable carabao-based dairy enterprise through capacity-building, and 4) increase sales and profit through product development and promotion. In order to achieve these, S&T interventions were applied. These included formation of a community/cluster milk collection system, conducting milk quality testing (raw and end-product assessment), performing laboratory analysis of dairy products produced, monitoring of record-keeping and accounting, improving product and packaging, and enhancing marketing and promotion activities. The Magdalena Dairy Raisers Association (MADRA) was identified as the recipient of the two-year project (March 2013-March 2015). During its first year, two milking clusters were established in Barangays Balanac and Saladsad in Magdalena town. Records showed that milk collection in these two villages increased by 66%-166% owing to the 50-80 liters collected daily compared to their previous collection of 30 liters a day. This was due to the increase of raw milk suppliers, from the previous four to 13 suppliers to an average of 18 suppliers. The association was also provided with processing facility and was given sanitary permit. The production staff was trained for good manufacturing practice (GMP) and food safety protocol. To improve the quality of the dairy products produced, daily milk quality testing was done both for raw and processed products. The Department of Science and Technology (DOST) in Region-IVA conducted the microbial analysis of dairy products, such as pasteurized milk, chocomilk and white cheese, pastillas, yoghurt drink and frozen yoghurt mix. Appropriate product packaging with label was also applied in conformance to the basic Food and Drug Authority (FDA) standards. New packaging and labels were appropriately developed for the dairy products. In August to December 2013, a total of 9,345 liters of milk were collected on a daily basis, an increase of 124% compared from previous year’s collection of 4,163 liters. The milk collected translated into a gross income of Php743,187 or 198% increase from the earnings of Php249,795 in the previous year. The marketing and promotion of the dairy products were likewise improved. The product distributors now include white cheese makers, Baryo Froyo Enterprises, individual product retailers, dairy processors, Mr. Moo & More Pasalubong Center, PCAARRD and Kamay ni Hesus Shrine in Lucban, Quezon. The project aims to enhance the carabao-based dairy farms in Baybay, Leyte through wider adoption of flushing and supplementation through the STBCF modality. The Baybay Dairy Cooperative was selected as the recipient of the three-year project (March 2013- March 2016). As of November 2014, records showed that 110% of the milk collection targeted for three years was already achieved. The co-op’s 29 dairy farmers were able to produce 27, 243 liters of milk owing to the increased average daily production of 4.8 liters per buffalo head compared to their previous collection of three liters a day. The lactation period was also improved from 260 days to 272 days.